Within the Red Rocks Park exists an Eco-Savvy Micro Insect World Spring, Summer and Fall. There is much more to The Beatles than simply music in-beat-sync, note and harmony of nature. Take our beautiful honey bee shown below; she dances with true stars. 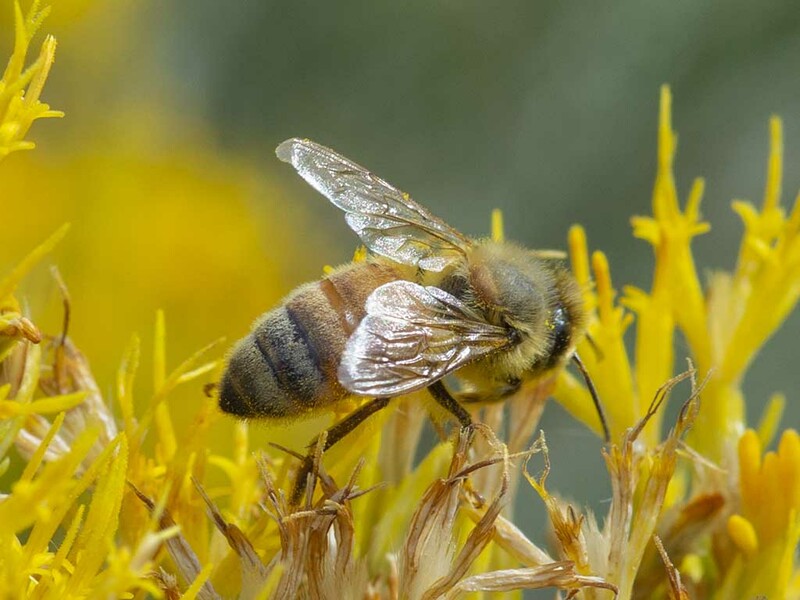 Happy Honey Bee, Hymenoptera Apidae, feeding on late summer bloomer, Rabbitbrush, of the flora family Asteraceae. We plan on featuring more updates on fauna and flora as we collect and make available our photos and data from within the Red Rocks Park over the past years and future photo shoots. Our Insects are cataloged by Order and Family. Subsequent to that we will be featuring more Red Rocks Park insects as our blogs develop also. Some see the Lions, Tigers, and Bears, oh my, as the Large top predators in the Planet. However we can show you the same ferocity in our Small bio-diverse Insect World here at the Red Rocks Park. Below features, according to Professor Pearson, a unique photo with two Female Praying Mantis in a death-match fight. 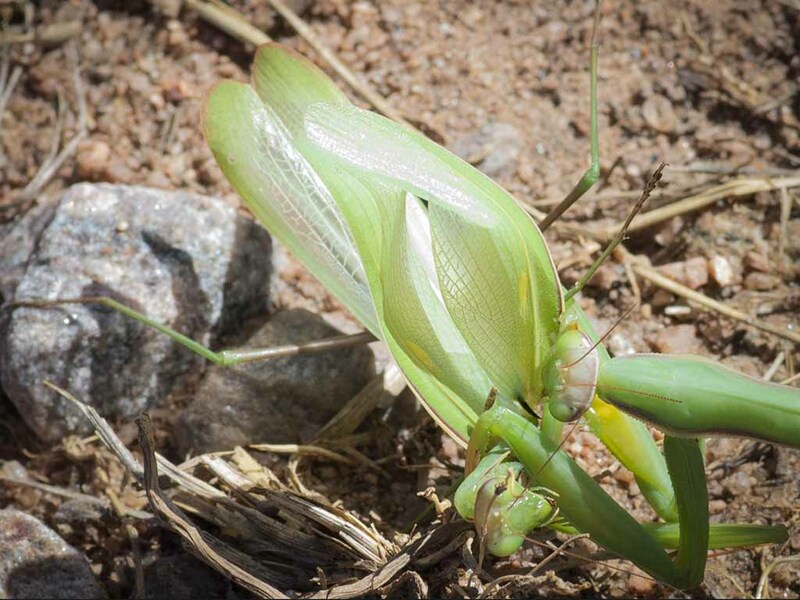 There were many sightings of mantidae this summer which indicates that 2018 was a great year for the Praying Mantis to thrive. 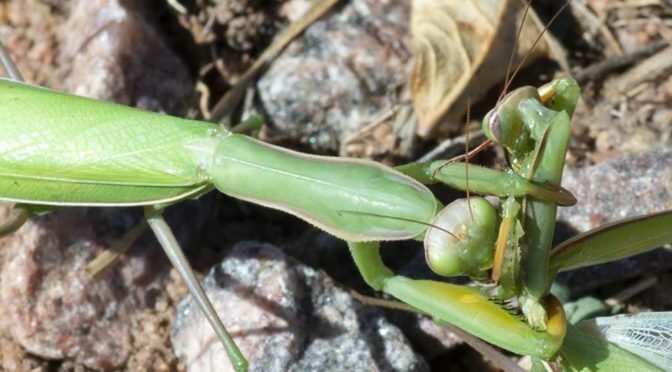 Female Mantodea, Mantidae severing her female opponents arm, rather disarmingly, mantis style. Photo by T. Johnson © 2018, all rights reserved. Entomology reviewed and co written by C. Pearson, PhD. Multimedia and blogs by T. Johnson, BFA.